Infrastructure management (IM) refers to the developing management of essential components in an organization. Managing infrastructure aims to reduce duplication, ensure standards are adhered to, enhance information flow and maintain policies within an organization (Rouse, 2007). The Infrastructure-as-a-service (IaaS) cloud model has led to the emergence of virtual infrastructure management. Organizations can now manage its infrastructure as private or hybrid cloud. One of the main reasons for using virtual IM is to provide homogeneous access to resources (Sotomayor, Montero, Llorente, and Foster, 2009). This report discusses the vendor management aspect in managing infrastructure. Vendor management issues, the management complexity and ways of reducing this complexity are also discussed. Microsoft will be used as the case study for vendor management. Vendor management is a discipline that helps an organization to ensure control on costs, ensure quality service delivery and risk mitigation for improved value from its vendor’s throughout the deal. It is part of the supply chain management business function. It includes searching and sourcing for vendors, quoting, negotiation, job assignments, performance evaluation and payments. The process involves creation of relationships. A company might have different vendors to supply different goods for their operations. The vendors have different contract terms and rates of payment. Managing vendor relationships is vital in order to realize benefits for both parties. An organization needs to understand what service or goods they need and what type of vendor is going to be outsourced (Fournier, 2015). Vendors are not only selected by their ability to meet requirements, performance and price. Selection is not only done to meet current needs but also for future requirements. Vendors could be analyzed using their dependency and drive or willingness to do business. An interpretive structural modeling (ISM) is used to carry out this evaluation (Mandal, and Deshmukh, 1994). In Microsoft, sourcing commitments are advanced through analyzing risks and opportunities, accountability and assurance; and capacity building (Microsoft, 2018). The vendor management process begins by creating a relationship after the type of vendor is selected. Forming third party relationships helps a business obtain value in the services provided through relationship oversight. Microsoft also focuses on building relationships with its vendors or suppliers. They seek to work with suppliers who are capable, competitive and compliant in order for them to achieve their goals. There are three approaches in that could be used in vendor management. The first approach is to the centralized approach. In this approach consistency and control are offered. The vendor management or the procurement officials handle this approach. The second approach is decentralized. It offers responsiveness to issues. It is handled by business officials or the information technology department. The third approach is hybrid. In this approach all vendor management functions are shared within the organization depending on where they fit (Heath, 2017). When building a relationship with Microsoft, there are documents provided by the organization in order to work with them. It has a Master Supplier Services Agreement (MSSA).This document has specifications on standard payment terms and spend reporting. A Supplier Code of Conduct (SCoC) is also provided. Microsoft business partners are expected to follow these standards of conduct. The Supply Guidelines outlines the requirements that vendors should follow. The Supplier Security and Privacy Assurance (SSPA) is a program that drives compliance of vendors in processing of data and requirements protection. It also has the Accounts Payable Support Desk for vendors’ support (Microsoft, 2018). The next step is managing suppliers. According to Webb (2018), managing suppliers ensures competitive advantage for a business. The Strategic Supplier Management (SRM) framework is used. To ensure strategic supplier relations, it is first important to ensure the suppliers have a clear and honest view about the organization. Microsoft ensures that its employees are familiar with the company by giving guidelines and documents for referencing purposes. The communication between the parties should be able to strengthen the relationship. Microsoft ensures effective communication by having a support system for vendors. Holding meetings with suppliers is also important. During these meetings, discussions on performance and goals could be discussed. Such meetings also help the suppliers gain more knowledge about the organization. Microsoft also has training programs and conferences for its employees. Another way to ensure strategic supplier management is to ensure the suppliers act accordingly. Formulating policies and guidelines is therefore necessary. Behaviors such as late delivery show the supplier is not well invested in doing business with the organization. Microsoft strives to ensure that its suppliers uphold human rights, labor health and safety, environmental and business ethics. It has a supplier code of conduct document publicly available. Microsoft devices suppliers’ are evaluated through its Social and Environmental Accountability (SEA) program (Microsoft, 2018). A vendor-managed inventory is an initiative in which the supplier can manage the inventories agreed upon. The system helps reduce stock-outs and inventory costs are reduced. It helps in making decisions on resupply. Tracking of the supply process can also be done using the system (Waller, Johnson, and Davis, 1999). Microsoft Dynamics 365 is a product that has enterprise resource planning (ERP) capabilities. It has an inventory management feature that helps in carrying out inbound and outbound operations, quality assurance, inventory activities and inventory control (Microsoft, 2017). Outsourcing vendors helps improve service quality, improve operational efficiency, reduce on costs, accelerate delivery of services and more focus on business functions. Having a consolidated vendor management helps reduce on cost. Consolidating among reduced number of vendors increases purchasing power (BLM Technologies, 2018). Vendor management is important because changes in responsibilities like infrastructure support maybe be shifted to the third parties. The vendor needs to access the organization’s assets like servers in order to provide the appropriate service. Vendor management helps promote quality service delivery, provide user support during a system’s deployment and it allows for sharing of the responsibility of adjusting to changes (Microsoft, 2010). Microsoft (2010) suggests that staying in sync with vendors requires understanding of what in required in the same language, identifying handoffs and development of expectations. For effective communication, meetings could be used in order to stay in contact. It also suggests evaluation and management of risks and dealing with issues as they come before enforcing them into the contract. There are several challenges faced when working with vendors. The first challenge is unresponsiveness to help requests. Vending companies face problems that could translate to clients’ problems. Security conflicts and issues in interests could arise as in the case of Walmart. Slow products’ improvements are also another issue (Talbott, 2017). Tracking of a vendor’s supply records is challenging. If the vendor is not well known by the organization, building healthy relationships becomes an issue. The different culture between the buyer and the vendor is also an issue. Microsoft allows contracting with individuals or organizations form all ethnic groups. Since Microsoft carries out its operations in English, individuals from other natives may not communicate effectively with the employers. Lack of effective communication leads to poor service delivery. Lack of understanding the organization’s goals is also an issue. Some vendors do not give interest in understanding the organization’s goals. A gap in the relationship could be created by lack of transparency in the processes. Another issue that would affect vending is overload on the vendor. Some vendors take contracts from different vendors. They might deliver poor quality services due to the pressure of delivering to different customers. This could sometimes lead to late delivery of services. Timely delivery is one of the ways of building the relationship. If delivery is not done on time, the relationship could be weakened. Due to the different requests given from different clients, a vendor might deliver incomplete service. Sometimes the products are supplied while broken. Some of the vendors need proper training and nurturing on how to carry out delivery or supply. While outsourcing, a company might not receive quality work from vendors with inadequate skills and understanding of what the business is about. Nurturing the relationships after a project or the contract is terminated is also an issue. This means that whenever the company needs to outsource for vendors, new relationships have to be formed. Carrying out the entire process of requirement determination and vendor selection becomes time wastage. New costs would be incurred compared to if the relationships are maintained for future projects (Invoicera, 2018). Automating the vending process and acquiring the right documentation is challenging to small business. While in big businesses, risk assessments and security are a challenge. Small companies do not have the power to demand appropriate documentation form vendors. The small organizations also do not have required skills to analyze reports. Lacking expertise in a large organization behaviour is a challenge in vendor management. Experts are needed in order to carry out risk assessment (Top vendor management challenges and how to overcome them, 2018). Creation and refreshing of vendor management should be made a priority. The programs set should be reviewed often to ensure it performs as required. Specific assignation of a vendor manager is important. This assists in management of the vending programs. The vendor manager should follow the guidelines stated and no traces of biasness either in vendor recruitment or vendor management shoËuld be noticed (Top vendor management challenges and how to overcome them, 2018). Microsoft has a procedure for hiring vendor managers. Available vacancies are announced publicly through their website for all legible candidates to apply. Implementing a risk management solution is also important. Risk management programs ensure the company understands its risks and initiates risk mitigation. Spreadsheets are not as effective as risk management solutions in making changes to huge amounts of data. Meeting writing during board meetings should also be done. Vendor relationships should be strong to prevent cases of cyber security as a way of ensuring information security (Top vendor management challenges and how to overcome them, 2018). Trends in vendor management include standardization. Standardization helps improve an organization’s vendor management to obtain a competitive advantage. Vendor consolidation is another technique that increases purchasing power. This technique is beneficial to companies with few employees. Robotic Process Automation (RPA) is a technique in which robots are used in management on behalf of humans. This technique reduces operational costs. Governing a multi-vendor model has been shown to improve profit compared to labor management. The multi-vendor governance model is implemented by transformation of the model into a service, accountability of the model. Compliance in vendor management is also a trend. Apart from compliance being implemented in a company’s departments alone, it has also been enrolled in management. Microsoft ensures compliance from its employees by setting guidelines and compliance terms. These terms are given publicly. Corporate culture helps protect a company’s reputation. Third party governance is another trend. Companies are also venturing into innovative ways of having a competitive advantage. In order to reduce costs and ensure continuous profitability, organizations are opting for long term contracts. Vendor governance is not only about managing vendors, but also managing the relationships formed. Experienced clients and vendors understand the importance of managing relationships for long term benefits of outsourcing (WGGroup, 2016). Some vendors do not keep up to the requirements of the contract. They might not deliver timely or not comply with the terms set. Language and cultural differences are among the reasons for these problems. This in turn leads to increase in costs, poor quality in deliverables and delays. The multi-vendor complexity and dependency add to the short comings. Vendors might have also not understood the requirements of the business. However, there are guidelines on handling vendor management complexity. Communication is very important in vendor management. Effective communication between vendors and the company is important. Holding regular meetings with board members, the project team and the vendors is important. Assigning roles and responsibilities is also important. If possible, a project leader should be appointed (Chebunin, 2017). Performance reports should be given on a regular basis. The report should contain progress updates and issues that emerged during the processes. Problem solutions, and mitigation plans should be suggested in the report Ramalingam, Nair and Yuen, 2017). Spending more time on issues and risk management is recommended to ensure that the deliverables are timely and of good quality. Multi-vendor projects have higher chances of having issues. Having a centralized system in which issues can be raised is important. Microsoft has the Accounts Payable Support Desk for vendors’ support (Ramalingam, Nair and Yuen, 2017). Change management should also be looked into. Before any proposed changed is considered, its effect should be determined. Effective change management processes should be put in place. Changes in work scope, project schedule and costs are dealt with differently (Ramalingam, Nair and Yuen, 2017). Dividing the project into different phases should be done. Each vendor should know what deliverables should be given at the end of each phase. Gantt charts could be used for the planning (Chebunin, 2017). Vendors in an organization are managed using a vendor management system. Companies that have vendors for their different requirements have complex multi-vendor systems. Such systems are prone to issues thus proper measures are taken to handle the complexity. Guidelines and codes of conduct are important for vendor management. Building strong client-vendor relationships is also important to derive value from outsourcing. Microsoft is one of the companies that manage its vendors through effective codes of conduct, programs and vendor support systems. 1. BLM Technologies, 2018. The benefits of vendor management. [online] Available at: <https://www.blmtechnology.com/company/blog/benefits-vendor-management/> [Accessed 25 Sep. 2018]. 2. Chebunin, T., 2017. Mistakes of managing multi-vendor projects. [Blog] ITransition. Available at:< https://www.itransition.com/blog/mistakes-of-managing-multi-vendor-projects> [Accessed 26 Sep. 2018]. 3. Fournier, J., 2015. 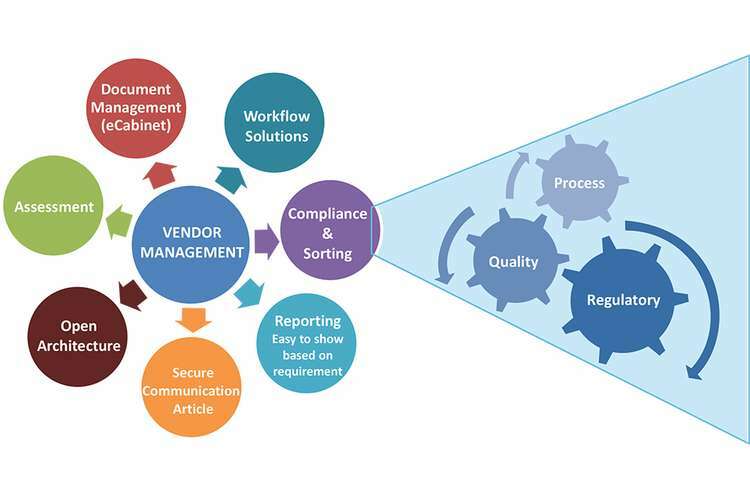 What is vendor management. [Blog] HCMWorks. Available at: <https://www.hcmworks.com/blog/what-is-vendor-management> [Accessed 25 Sep. 2018]. 4. Heath, N., 2017. How to manage vendors in a cloud-first world. [online] ZDNet. Available at: <https://www.zdnet.com/article/how-to-manage-vendors-in-a-cloud-first-world/> [Accessed 25 Sep. 2018]. 5. Invoicera, 2018. Top 10 Challenges faced in Buyer Supplier Relationship Management. [online] <Available at: https://www.invoicera.com/blog/top-10-challenges-faced-in-buyer-supplier-relationship-management/> [Accessed 25 Sep. 2018]. 6. Mandal, A. and Deshmukh, S.G., 1994. Vendor selection using interpretive structural modelling (ISM). International Journal of Operations & Production Management, 14(6), pp.52-59. 7. Microsoft, 2010. Best Practices for Service Vendor Management. [online] Available at: <http://download.microsoft.com/download/A/2/0/A20F5FEB-1719-4B2F-8FFC-A0A14318CD2D/Best%20Practices%20for%20Service%20Vendor%20Management.docx> [Accessed 25 Sep. 2018]. 8. Microsoft, 2017. Inventory management. [online] Available at:< https://docs.microsoft.com/en-us/dynamics365/unified-operations/supply-chain/inventory/inventory-home-page> [Accessed 25 Sep. 2018]. 9. Microsoft, 2018. Doing business with Microsoft. [online] Available at: <https://www.microsoft.com/en-us/procurement/supplier-contracting.aspx> [Accessed 25 Sep. 2018]. 10. Microsoft, 2018. Responsible sourcing. [online] Available at: <https://www.microsoft.com/en-us/about/corporate-responsibility/responsible-sourcing> [Accessed 25 Sep. 2018]. 11. Ramalingam, M., Nair, M. and Yuen, F., 2017. How to Manage a Complex Multi-Vendor Project Successfully. [online] Genius. Available at: <https://www.geniusproject.com/blog/about/tips-to-manage-a-complex-multi-vendor-project-successfully/> [Accessed 26 Sep. 2018]. 12. Rouse, M., 2007. infrastructure management (IM). [online] TechTarget. Available at: <https://searchcio.techtarget.com/definition/infrastructure-management> [Accessed 25 Sep. 2018]. 13. Sotomayor, B., Montero, R.S., Llorente, I.M. and Foster, I., 2009. Virtual infrastructure management in private and hybrid clouds. IEEE Internet computing, 13(5). 14. Talbott, A., 2017. Infographic: Time spent managing vendor relationships is on the rise. [online] ZDNet. Available at: <https://www.zdnet.com/article/infographic-time-spent-managing-vendor-relationships-is-on-the-rise/> [Accessed 25 Sep. 2018]. 15. Top Vendor Management Challenges and How to Overcome Them. (2018). [Blog] Venminder Blog. Available at: https://www.venminder.com/blog/vendor-management-challenges-and-how-to-overcome [Accessed 25 Sep. 2018]. 17. Webb, J. (2018). How to manage strategic suppliers. Forbes. [online] Available at: https://www.forbes.com/sites/jwebb/2018/03/30/how-to-manage-strategic-suppliers/#6462b2bb7994 [Accessed 25 Sep. 2018]. 18. WGGroup. (2016). The top 9 trends in vendor management. [online] Available at: https://www.slideshare.net/ThinkWGroup/the-top-9-trends-in-vendor-management-62585603 [Accessed 26 Sep. 2018].